Well, clearly the theory on our readers’ preference for alphabetization has been borne out — the two A names have advanced to the final round. In both cases, the semifinal voting patterns seemingly reflected the blocks that won. In the first, a dominant mismatch of speed where (at least in retrospect) the opponent had no chance; in the other, the outcome was in doubt until the last moment. Now, here we are, with a final showdown. Votes for the final will be tallied both on our site, as well as through our Instagram. The winner will be the one with the most combined votes on this page and our Instagram story, so be sure to weigh in on both polls! Voting is now open and will close on Monday, January 28th, at 12:00 PM Eastern. From the start, the semifinal on the female side of the bracket was a no-doubter: Ultiworld readers clearly agree that Olivia Arellano would advance. Staked to an early voting lead, Arellano continued to pull away all the way through the round. Garnering 78% of the vote, it was the largest margin of victory for any matchup in the bracket to this point. Will her dominance continue in the final? Much like his block in San Diego, Alanguilan looked like he had almost no chance to reach his goal for much of the matchup. On the final morning of semifinals, Von trailed Basten De Jongh by a healthy margin; then, with only hours left in the matchup, the Machine star turned on the jets in the final moments to surge past his opponent and knock him off by just 50 votes. Will be be able to track down Arellano? 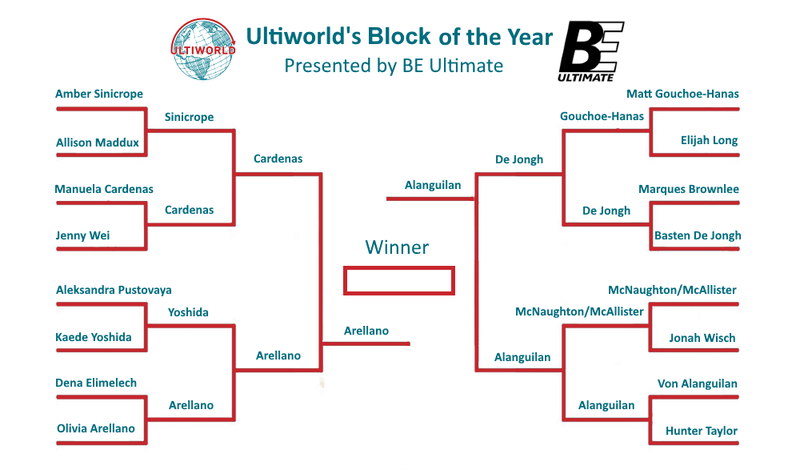 Comments on "Ultiworld’s 2018 Block Of The Year Bracket: Final, Presented By BE Ultimate"